The HTC DROID DNA has been sizzling hot over at Verizon, where the 5 inch FHD screen and its 441ppi pixel density is one of a number of devices that offer the current industry leading pixel density such as the ZTE Grand S, which was introduced at CES, and the Huawei Ascend D2 to name a few. Once the HTC One is launched, that could change as that device is expected to offer a FHD display on a smaller 4.7 inch screen. That would work out to an amazing 468ppi pixel density. 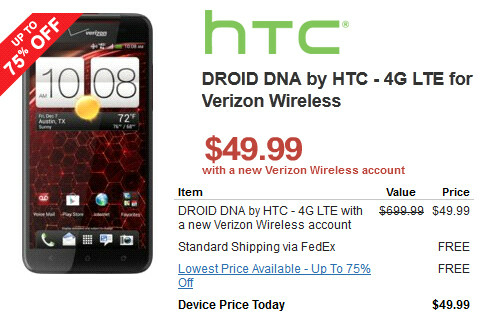 Anyway, if the HTC DROID DNA is what you have your heart set on, you can buy the device for just $49.99 from Wirefly. You do have to open a new account that you're locked into for at least two years. Or, if you're upgrading a current account, your price for the phone is a still discounted $99.99. The regular contract price is $199.99. We don't know when this deal will expire, so we would suggest not stalling or procrastinating. You do have a few seconds to check out the rest of the phone's specs such as the quad-core 1.5GHz Qualcomm Snapdragon S4 Pro processor under the hood, the 2GB of RAM on board and the 16GB of native storage aboard. There is no microSD slot on the device. The 8MP camera on back captures video in 1080p while the 2.1 front-facing camera enables video chat and takes self-portraits. Without the two-year signed contract, the price for the HTC DROID DNA is $699.99, which makes your signature rather valuable, wouldn't you say? Your phone gets outdated after 2 or 3 months? waiting on the note 3 with the flexible screen even though i dont really want a 6inch phone i want a flex screen..forget about the dna! I already bought Droid DNA from USA but now I'm using in Afghanistan, my 2013 smartphone. one thing i want to say about Droid DNA " AMAZING ".